LANSING — Michigan native Erik Rintamaki discovered a glowing rock on the shores of Lake Superior — and a new career path. He doesn’t claim to be the first person to have found it on the beaches, but he is the first to get the stone verified by a lab at Michigan Technological University. He uses a blacklight to illuminate the beach. Yooperlites glow a fluorescent orange when the light hits them. But yooperlite has opened doors for Rintamaki. 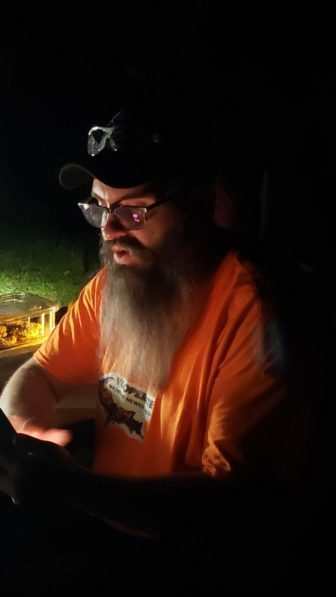 He hosts yooperlite tours from Brimley, sells the stones on eBay and says he hopes to trademark the name to sell merchandise with it. 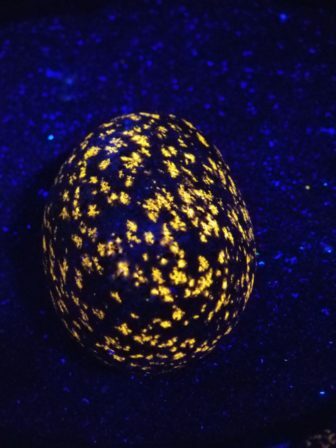 “As soon as your flashlight hits one of these rocks, it glows like there is an internal fire in that rock,” said Molly Spencer, who took the yooperlite tour in August. The tours can be booked through the yooperlite Facebook page and yooperlites.com. This season he led all of the tours himself, but he might have to hire more tour guides for next summer if the demand continues to grow. Since his discovery, he has been interviewed by many publications including Forbes, CBS News, the Detroit Free Press and news organizations in Asia. Rintamaki has depended heavily on the support from online communities, including Nature’s Rainbow on Facebook and the Florescent Mineral Society, which is a community of professional and amateur rock hounds. Members post their rock finds on the group’s Facebook page and gain feedback from other members. Although he could focus on his new popularity and the sales demand for the yooperlite, Rintamaki says he likes to connect with other people, hear their stories and share his. “Every time someone finds their first it takes me back to when I found my first one,” he said. As he guides groups up and down the shoreline he makes it his mission to help each individual discover a yooperlite of their own. “There is something absolutely magical,” he said. When he’s not working at a casino as a poker room supervisor, he plans to collect rocks until the snow falls. He anticipates a busy season next year. “This has been quite the little journey I’m on so far and it’s just getting started,” Rintamaki said. Michigan law enforcement officials are worried about how they will enforce driving while high laws if the recreational marijuana ballot proposal is approved this November. They say there is no good roadside test like a breathalyzer for alcohol. We talk to the Cheboygan County undersheriff and the executive director of the Michigan Association of Chiefs of Police.